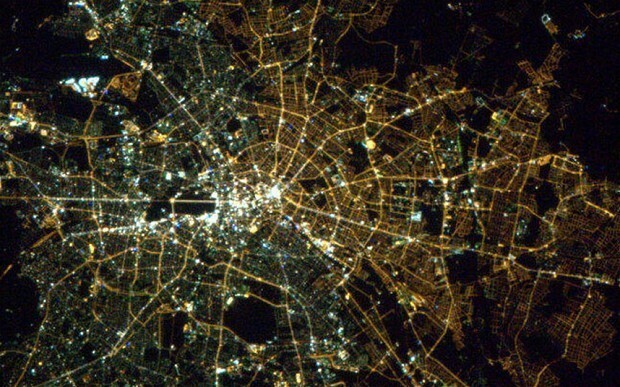 From Space, you can still see the division between East and West Germany due to different light bulbs. Berlin, as you may know, is my favorite city I’ve ever been to. It’s the only place where I’ve been engrossed by its history (I’m not a history guy,) so this image fascinates me. Since West Berlin is home to most of the commercial and shopping districts, they’ve fully converted to the more modern electric lighting. Nearly a fifth of the street lights in the German capital are gas-powered, yielding a softer illumination. City authorities plan to replace these lights with electric lamps to reduce energy consumption. Frankly, I wish East Berlin would stick with the more classic gas lamps – it gives that part of town a more authentic feel. Great photo! Berlin is also one of my favourite cities in Europe, right after Prague. My mom is a history teacher so I’ve learnt a lot about the 2nd World War and history of Germany. They are quite some interesting facts. After so many years of reunification it is still amazing at how much longer it takes for the signs of the past are gone forever. I really enjoyed my time in Berlin too, although admittedly it was a long time ago now. My sister spent a year living and working there near the Brandenburg Gate. It is interesting, and I think it’s good when they hold onto past traditions, especially in a city with so much amazing (albeit not so positive) history. I really like that East Berlin has held onto Ampelmännchen – the green pedestrian walking man – so much that it’s become a symbol of the city.